Citation: Verma AK. Role of neuropeptides in allergic diseases. J Pulmonol Clin Res. 2017;1(1):5-7. 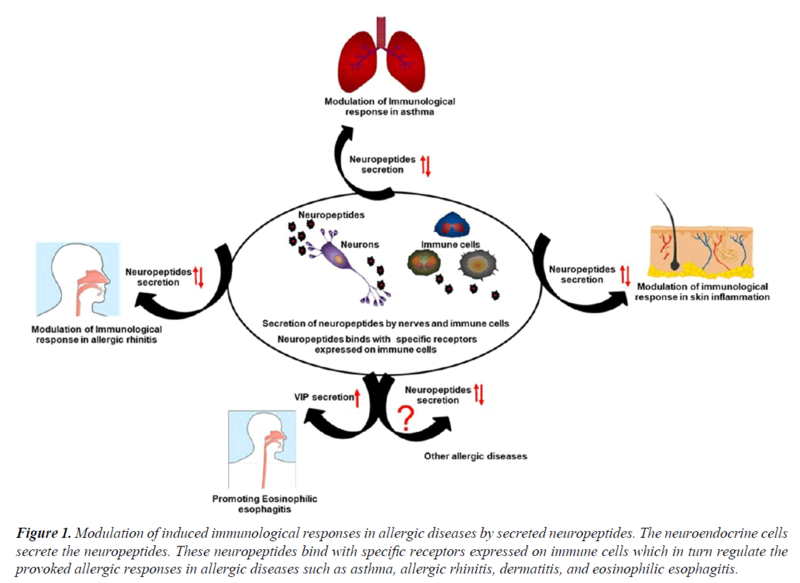 The increasing prevalence of allergic diseases and involvement of neuropeptides in the modulation of allergic responses attracted the attention of clinicians and researchers to explore the neuro-immune interaction in the allergic diseases . The nervous system releases neuropeptides that modulating the immune response through interactions with the inflammatory cells. Therefore, the participation of these neuropeptides in the pathophysiologic background of the allergic disease cannot be ignored. Earlier, the large number of neuropeptides such as vasoactive intestinal peptide (VIP), calcitonin gene-related peptide (CGRP), substance P, Protein gene product 9.5, Neuropeptide Y, and Nerve growth factor have been implicated in the pathogenesis of the allergic diseases [2,3]. The progression to a particular type of the allergic disease also depends on the interaction of specific neuropeptide with specific immune cells such as T cells, B cells, eosinophils, mast cells, neutrophils, basophils, and macrophages. A recent study has shed light on the role of neuropeptides in atopic dermatitis patients, where increased expression of CGRP, CGRP-receptor, Substance P, Substance P-receptor, and nerve growth factor receptor TrkA were observed suggesting the association between the enhanced production of neuropeptides and pronounced inflammatory responses as detected in the skin . The significance of VIP in allergic diseases such as asthma, allergic rhinitis, and atopic dermatitis is well reported [4-7]. Most recently, we showed that VIP modulates the immune response in the allergic esophageal disease termed as eosinophilic esophagitis (EoE) through interaction with CRTH2 receptor (chemoattractant receptor homologous molecule expressed on Th2 lymphocytes) expressed on eosinophils and mast cells . Basically, EoE is a chronic inflammatory disease of esophagus. Our study showed eosinophils and mast cells accumulation in esophagus via interaction of CRTH2 receptor with nerve-derived VIP. Based on data, we suggested the inhibition the VIP-CRTH2 axis to ameliorate the dysphagia, stricture and motility dysfunction in chronic EoE patients . CGRP is another important neuropeptide of enteric sensory neuron that causes the microtubule reorganization in mucosal mast cells, augmenting their degranulation that promoting the development of food allergy . Further, mice deficient in Receptor activity-modifying protein 1 (RAMP1), a component of CGRP receptor showing reduced airway resistance as compared to wildtype mice . CCL17 induced CCR4-dependent CGRP synthesis in airway epithelial cell of asthmatic patients were observed that can be a possible target for the treatment of asthmatic patients . However, the anti-inflammatory potential of CGRP was also reported in asthma model as this neuropeptide has the ability to reduce the proliferation of antigen-specific T cells and enhancing the T regulatory cells via modulation of DC function . A study by Kay et al. indicated the enhanced expression of CGRP in the lesional skin as compared to the non-lesional skin in chronic spontaneous urticaria patients . Another finding might be in line with an earlier study demonstrating that CGRP enhances the production of IL-13 in peripheral blood mononuclear cells from patients with AD, and playing an important role in the pathogenesis of disease by shifting the immune responses towards Th2 pattern (Figure 1) . Figure 1. Modulation of induced immunological responses in allergic diseases by secreted neuropeptides. The neuroendocrine cells secrete the neuropeptides. These neuropeptides bind with specific receptors expressed on immune cells which in turn regulate the provoked allergic responses in allergic diseases such as asthma, allergic rhinitis, dermatitis, and eosinophilic esophagitis. The role of another neuropeptide of melanocortin family, α-melanocyte-stimulating hormone (α-MSH), is also emerging as a suppressor of skin inflammation. α-MSH induces tolerogenic dendritic cells, which in turn expand the functional regulatory T cells (Tregs) that are capable of efficiently inhibiting psoriasis-like skin inflammation . There is mounting evidence that upregulated release of neuropeptide Y occurs during stress condition that playing a critical role in the development of allergic airway inflammation in mice via interacting with its Y1 receptor . The expression of Mas-related gene X2 (MrgX2) that is identified as a receptor for basic neuropeptides, such as Substance P and VIP has been reported to be enhanced in skin mast cells of patients with chronic urticaria suggesting the involvement of these neuropeptides in urticaria . Additionally, Cima et al. has demonstrated the direct relationship between basophils and sensory neuropeptides such as secretoneurin (SN) and Substance P in the pathogenesis of allergic diseases. These neuropeptides induce the allergic condition mediated through NK-1 receptors present on basophil cells . Substance P also has the ability to stimulate the production of monocyte chemotactic protein 1 (MCP-1), which in turn promotes the inflammatory cells such as lymphocytes, basophils, mast cells, and eosinophils trafficking at the site of inflammation . Together, these available data suggest that there is utmost need to further explore the significance of neuropeptides in modulating the immunological response in the allergic diseases and unmask the involved mechanistic pathways. The better understanding of neuro-immune interaction will be helpful to develop new therapeutic strategies for combating these allergic diseases. Groneberg DA. Neurogenic mechanisms in bronchial inflammatory diseases. Allergy 2004;59(11):1139-52. Mikami N. Neuronal derivative mediators that regulate cutaneous inflammations. Crit Rev Immunol 2012;32(4):307-20. Smolyannikova VA, Patol A. Role of the skin expression of neuropeptides, neurotrophins and their receptors in the pathogenesis of dermatoses. 2015;77(4):33-39. Verma AK, Manohar MUVS, Mishra A. Endocrine cells derived chemokine vasoactive intestinal polypeptide (VIP) in allergic diseases. Cytokine Growth Factor Rev 2017. El-Shazly AE. Novel association between vasoactive intestinal peptide and CRTH2 receptor in recruiting eosinophils a possible biochemical mechanism for allergic eosinophilic inflammation of the airways. J Biol Chem 2013;288(2):1374-84. Szema AM. Mice lacking the VIP gene show airway hyperresponsiveness and airway inflammation partially reversible by VIP. J Physiol Lung Cell Molecular Physiology 2006;291(5):880-6. Umemoto N. Serum levels of vasoactive intestinal peptide are elevated in patients with atopic dermatitis. J Dermatol 2003;31(2):161-4. Verma AK, Manohar MUVSU, Blecker U, Collins MH, Mishra A. Role of vasoactive intestinal peptide in promoting the pathogenesis of eosinophilic esophagitis (EoE). Cell Mol Gastroenterol Hepatol 2017. Kim JH. CGRP, a neurotransmitter of enteric sensory neurons contributes to the development of food allergy due to the augmentation of microtubule reorganization in mucosal mast cells. Biomed Res 2014;35(4):285-93. Li M. Deficiency of RAMP1 attenuates antigen-induced airway hyperresponsiveness in mice. PLoS One, 2014;9(7):102356. Bonner K. CCL17/thymus and activation-regulated chemokine induces calcitonin gene-related peptide in human airway epithelial cells through CCR4. J Allergy Clin Immunol 2013;132(4):942-50. Rochlitzer S. The neuropeptide calcitonin gene-related peptide affects allergic airway inflammation by modulating dendritic cell function. Clin Exp Allergy 2011;41(11):1609-21. Kay AB. Calcitonin gene-related peptide and vascular endothelial growth factor are expressed in lesional but not uninvolved skin in chronic spontaneous urticaria. Clin Exp Allergy 2014;44(8):1053-60. Antunez C. Calcitonin gene-related peptide modulates interleukin-13 in circulating cutaneous lymphocyte-associated antigen-positive T cells in patients with atopic dermatitis. Br J Dermatol 2009;161(3):547-53. Auriemma M. Alpha-MSH-stimulated tolerogenic dendritic cells induce functional regulatory T cells and ameliorate ongoing skin inflammation. J Invest Dermatol 2012;132(7):1814-24. Macia L. Y1 signalling has a critical role in allergic airway inflammation. Immunol Cell Biol 2011;89(8):882-8. Fujisawa D. Expression of Mas-related gene X2 on mast cells is upregulated in the skin of patients with severe chronic urticaria. J Allergy Clin Immunol 2014;134(3):622-633. Cima KH, Vogelsinger CM, Kahler. Sensory neuropeptides are potent chemoattractants for human basophils in vitro. Regulatory Peptides 2010;160(1-3):42-8. Castellani ML. Stimulation of CCL2 (MCP-1) and CCL2 mRNA by substance P in LAD2 human mast cells. Transl Res 2009;154(1):27-33.